There are few flowers more stunning than a lotus in full bloom. And while there are many gorgeous flowers, none have taken on the symbolic significance of the lotus. The lotus has long been associated with purity, divinity, and faith. It is recognized as an important earthly symbol of desirable transcendent qualities. All ancient cultures use lotus in their religious art and architecture. It's seen as a sign of purity of speech, body, and mind. It's also a metaphor for a person's path in life. It represents the concepts of creation and awakening. Flowers and flower symbolism have been a part of cultures since antiquity. The lotus can be just a lovely flower, but for many, it's a sign of faith. PurpleBrick Lotus embodies the same spirit of the flower lotus. MYSORE - A CHARMING HERITAGE CITY, A LAND OF PALACES. Mysore is a charming city at the foot of Chamundi Hills in the southern state of Karnataka. It wears the crown of Cultural Capital of Karnataka. This rich cultural heritage is on display at the Mysore Palace, Jagmohan Palace and Art Gallery, Lalit Mahal Palace and Jayalakshmivilas mansion. Mysore has also been blessed by nature with the beautiful Chamundi hills known for their wildlife and numerous lakes. The temple of the presiding deity of the city, Chamundeshwari stands atop the Hill. The beautiful St. Philomenas Church combines religion and heritage and Datta Peetham ashram is a confluence of serenity and spirituality. Mysore also has its share of interesting museums. Mysore is connected to Bangalore by SH-17 which has been recently upgraded to 4-lane divided carriageway. This has tremendously reduced the commuting time and between the 2 cities. The expressway which is being developed under BMIC, would not only reduce the travel time but would also create new townships, which would be self-contained. Besides, the residential layouts the private developers have lined up an array of proposals to develop malls, convention centres, golf course etc. The city has now attracted a large number of IT/ITES companies like Infosys, Wipro etc., due to its old-world charm, salubrious climate, high standard of education, well managed city growth, and for its good linkages with Bangalore, Tamil Nadu & Kerala. Mysore - the most important city in Karnataka to put down your roots. If home is where the heart is, then Mysore beckons. PURPLEBRICK LOTUS - A SAFE INVESTMENT FOR A HAPPIER TOMORROW. 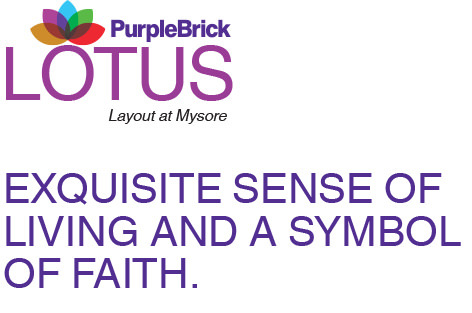 We take pride in presenting to you, our exquisite layout property, appropriately named as PurpleBrick Lotus. Spread across a land mass of 50+ acres, this wonderful property is available in 5 plot size options, to favour all types of needs and requirements. These options will enable you to have, great fun experiences with family & friends, or just sheer peaceful relaxation. You have enough space to have something for everyone, whether adult or child. Experience an exquisite sense of life, by owning your very own piece of land and relish that invigorating feeling. The state highway and doubling of the railway link, has reduced the travelling time between Bangalore and Mysore. 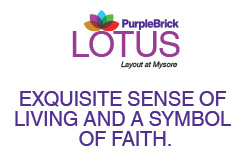 PurpleBrick Lotus offers you a chance to feel the enchanting beauty of Mysore by being a resident there. Build a home of your dreams, instil roots or invest in land to cater to the future generations. The safest investment in an uncertain, ever changing world.